Give your home a new and vibrant atmosphere with our selections of carpet flooring. Our showroom and warehouse provides a wealth of carpeting options that allow you to improve the look, feel, and overall value of your property. Ask one of our sales representatives to learn how to pick the right flooring for your property. We will gladly show you a great selection of floors that accommodate your design goals while also working within your schedule and budget. Carpeting is widely regarded as one of the mainstays of residential flooring. Renowned for its soft texture and diverse selection of styles, carpet flooring establishes a distinct look for your home’s interior. Put simply, guests feel more welcome to your property when a soft, plush carpet greets them. 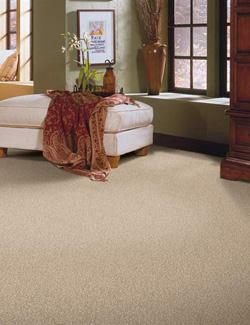 Our carpet store proudly carries many in-stock flooring types, including Berber carpet, Saxony, and polyester. In addition to its beauty and ability to be customized, carpeting provides comfortable insulation through the colder weather. The fibers in carpet help retain warmth, which gives your family and guests a warmer room to enjoy one another’s company. In addition, the cushion that carpeting offers helps absorb sound, which greatly improves the acoustics of a given room. Safety is a big concern for any residential property owner, especially when a household has toddlers and kids. As such, carpeting’s distinct textures provide a “non-slip surface” that reduces the likelihood of accidents. From eye-catching aesthetics to its many versatile applications, our carpets are a practical investment for every household. Thanks to our straightforward approach to flooring sales, we have stocked our warehouse full of many well-known carpet manufacturers, such as Mohawk™, Tigressa™, Shaw™, and Stainmaster™. On top of that, we have many different carpet types to choose from, which are each available in distinct patterns, color combinations, and textures. Choose from popular types like Saxony and Berber carpet. Other materials include nylon and polyester. From classic aesthetics to modern-day sensibilities, our carpet flooring collections offer a vast selection of colors, styles, and designs to help complete the look of nearly any room. Whether you are remodeling one room or your entire home, our carpet store makes it easy to plan, design, and complete your next project. Whether you are planning a completely new construction or renovation, our carpet store staff is readily available to assist you. Our friendly and knowledgeable sales representatives guide you through the selection process. Since we take a personalized approach to service, our representatives listen to your specific needs to guide you to the choices that best match your design goals. Of course, we do more than help you choose the carpet you want. We also coordinate the carpet installation services you need to complete your project according to your schedule. Choose our carpet store, and we will ensure that your new investment is placed neatly in your home. Our carpet installation service adapts to the unique characteristics of your property so you attain beautiful and sturdy flooring. Thanks to our skilled installation team, we are able to place your new carpet at a time most convenient for you. On top of that, we conduct all the necessary preparations so that your carpet looks it best. We will even remove your old flooring for you. Naturally, we are committed to your absolute satisfaction. Contact us today to learn how to improve the value of your property with carpet flooring. We proudly serve customers in Colorado Springs, as well as Monument, Palmer Lake, Security, and Widefield, Colorado.